Happy Wednesday, y'all! I uploaded my new back to school activity yesterday and I promised I would share today. 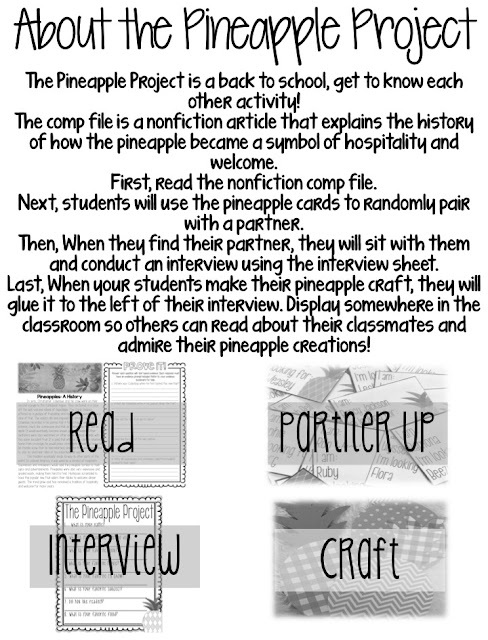 Okay, so what is The Pineapple Project? We start back to school on a Wednesday (which I love!) so for the first three days, we go over beginning of the year things like rules and procedures. I always do a little activity like The Faces of Fifth Grade, but I thought of something new this year and I'm excited to share with y'all! The thing I love most about the activity is that is a launching pad for writing text based evidence responses. 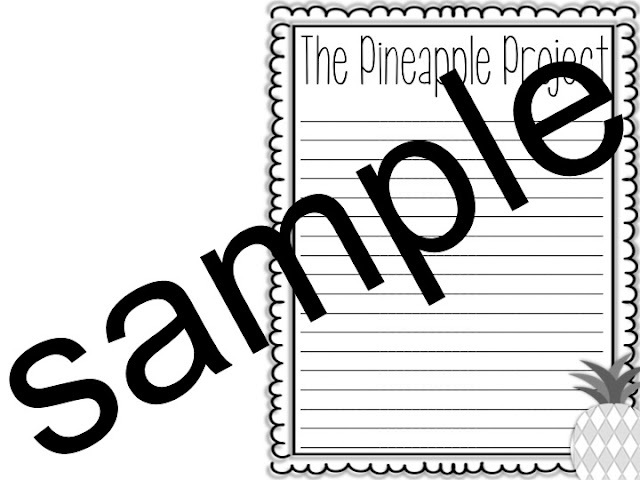 Using the format of my comp files, I wrote a nonfiction article about the history of pineapples and how they came to be known as a symbol of welcome and hospitality. First, the kids will read this text and answer the questions. Next, they will partner up using my pineapple cards! These are like my Find Me! group cards except these tell the students who they are and who they are looking for. The Find Me! group cards are a little tricker and include a description of fictional characters and historical figures. I LOVE using these to group kids! After they find their partner, they will conduct their interview to get to know their partner. I've included two options depending on the needs of your classroom. 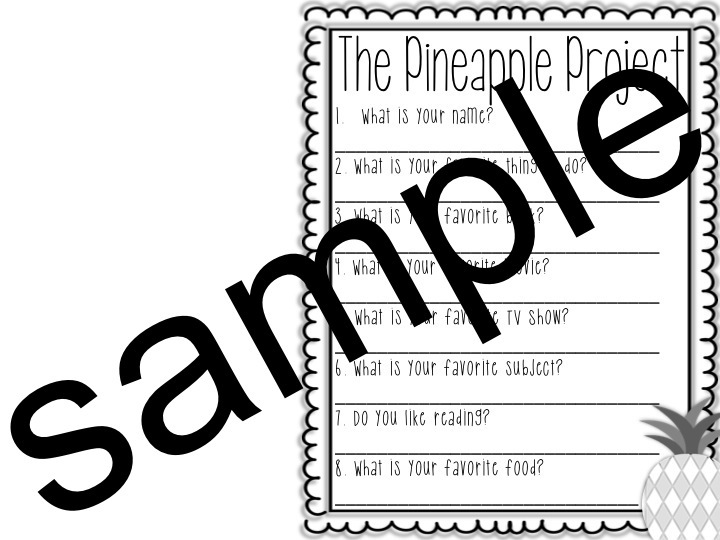 Then, the students will make their own pineapple! I've included two options for the craft. One requires cut and paste and the other is more of a print and color. Love everything about this!! I'm a brand new 5th grade teacher and I would love to plan this for my first week! I love this. Bring new to 5th is so exciting with things like this. I love how this sparks their interest in reading on the first day. I am living all your posts! Can't wait to try some. Love the bright colors! 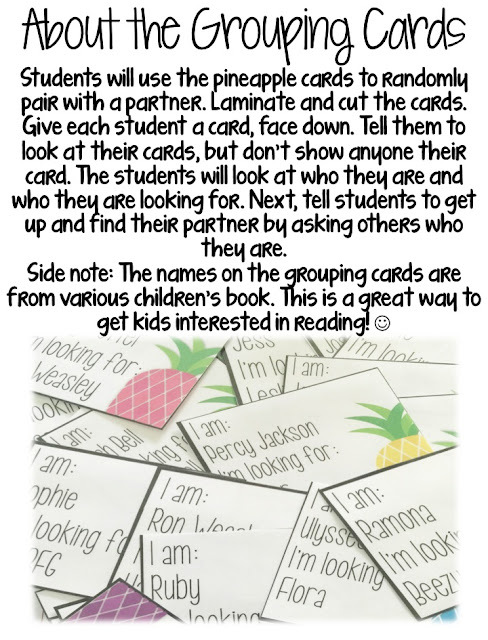 Great way to have students get to know each other and think about reading. I LOVE this!! And all of your products! I would love to plan this for my first week! Looks great! Very fun tame on a first week activity! This is super creative! I lived in a house that had a chair by the front door with pineapples on it. I loved telling people about the pineapple meaning hospitality. Thanks for these materials to bring hospitality to my classroom! Such a great activity. It is such a great way to encourage student to student talking. I love this! I will be sharing this with my team. This is wonderful! I am very anxious about my first week this would help tremendously! I love pineapples!! 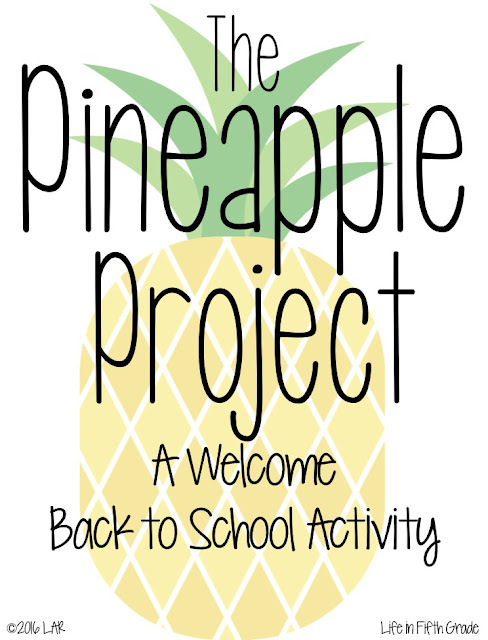 This is the perfect way to build relationships, and I love the idea of using a pineapple as a visual reminder of how we should treat one another all year! I love pineapples!! Not only is this a great way to build relationships, but I love the idea of using a pineapple as a visual representation of how we should treat one another all year long. What a great introductory resource!! I love pineapples! I'm so excited to use this during the beginning of school! This is such an awesome icebreaker!! It's a great way to begin with reading while the kids are engaged and having fun!! Can't wait to use this with my 5th graders!! I love this idea! I know my fifth graders would love this as much as me! 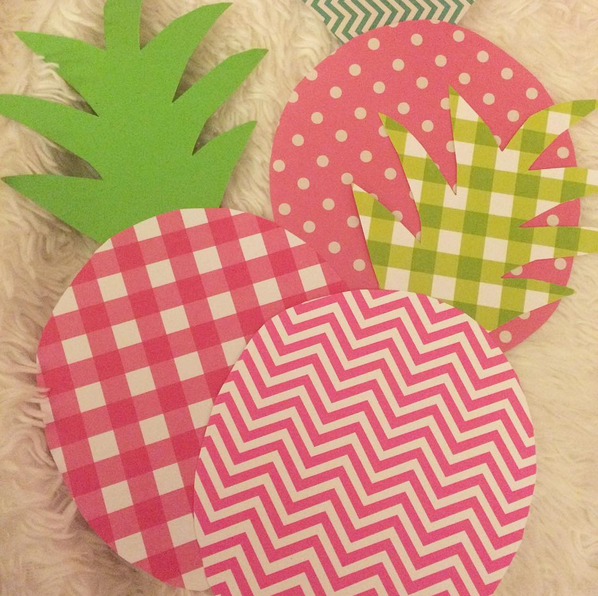 Love this idea even more than how much I love pineapples! What an awesome idea! We are switching to starting on a Wednesday this year instead of Monday. This is a great resource! This looks like a great way to start 5th grade! And it will be a great addition to our beach theme. This looks so cool! I think my kids would love to do this during the first days of school! Love this idea, and I'm sure my students would love it too! What a fantastic activity for the first week of school! :-) Thank you for sharing! 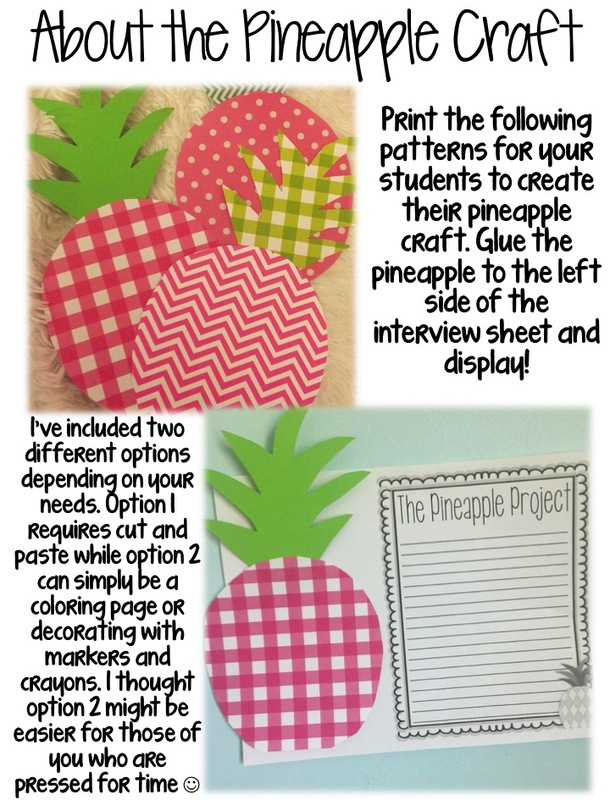 Thank you for sharing your creativity and love for Pineapples on TPT! What a great activity! 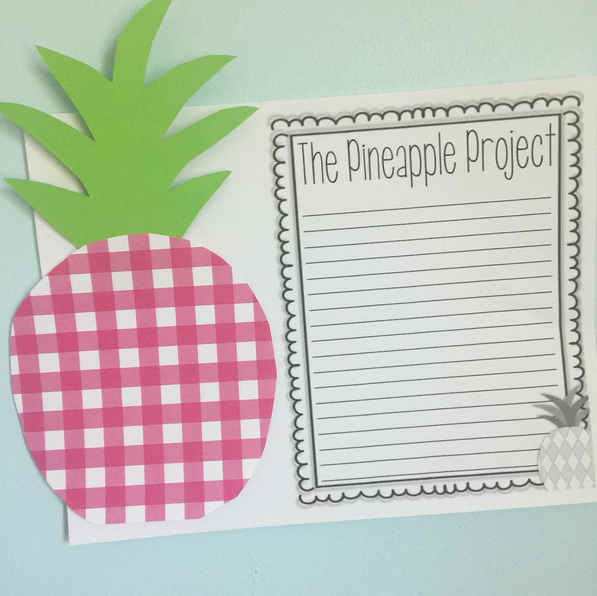 Thank you for sharing your creativity and love for Pineapples on TPT! Super cute! I love pineapples and I didn't know they were a symbol of welcome--- perfect for the start of a new year! I would love to be able to use this great project! I absolutely LOVE the idea of starting right away with text evidence! Plus, who doesn't love pineapples! They are just the cutest classroom decor! Sounds like a cute project and so creative! Great way to get them engaged with each other and the text! I will be new to 6th this year and would love to try this out! What a fantastic way to have students use connections and schema right away! This will be a great addition to my repertoire. Thanks! I love this! This is a "must try"! What a fun idea! I want to incorporate this into my back to school plans! I can't wait to incorporate this in my back to school plans! This looks like so much fun!! I love the grouping cards. I love this activity! I think it would work so well with my 6th graders. When students enter 6th grade they are coming from 8 different elementary schools. This would be such a fun way to partner them up, when they may not know anyone in the class! OMG. I'm always on the lookout for creative new ways to start the year. This is perfect. Since my school doesn't start till September I have plenty of time to shop for cute paper! Can you say Hobby Lobby?! 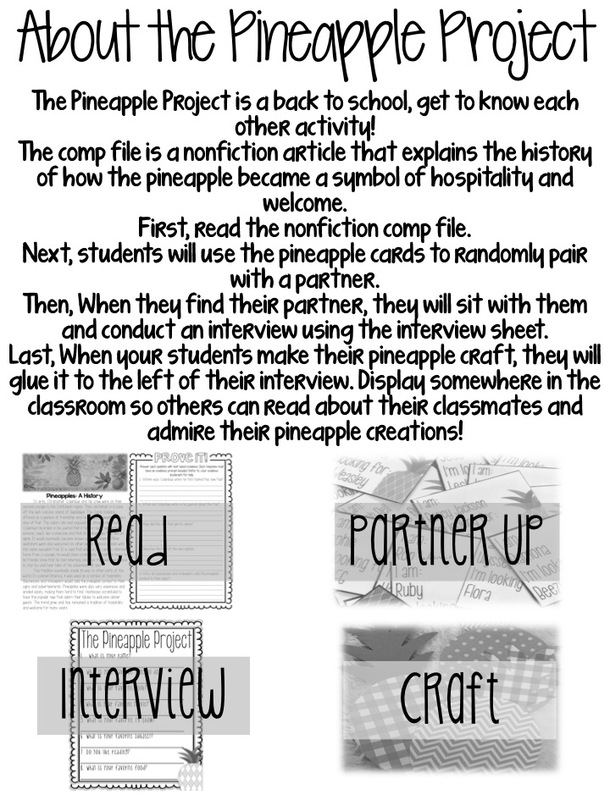 I would love to win The Pineapple Project for my class this year. I am new to fifth grade and this would be a great way to start the year off! This looks so fun and unique! Such a great start of the year project! I love how they start off with an academic piece! This is great. I have been anxiously awaiting this post as I have watched your posts on Instagram. I enjoy your academic approach with so much creativity. <3 Looking forward to using this activity on our first week of school in 5th grade as well. Love your site. So glad I found it! Great idea! Would love to win it! Wow! So many standards being covered here! :) Great mix! This is such a great activity. I love how you start the year right away with using text evidence in reading response. I found your blog a few weeks ago and...... I've been obsessed ever since! I am new to teaching fifth grade after staying at home with my kiddos for the last six years. Your blog, Instagram and TPT store have been amazing resources for me! The Pineapple Project look amazing! Thank you so much! This activity looks amazing! 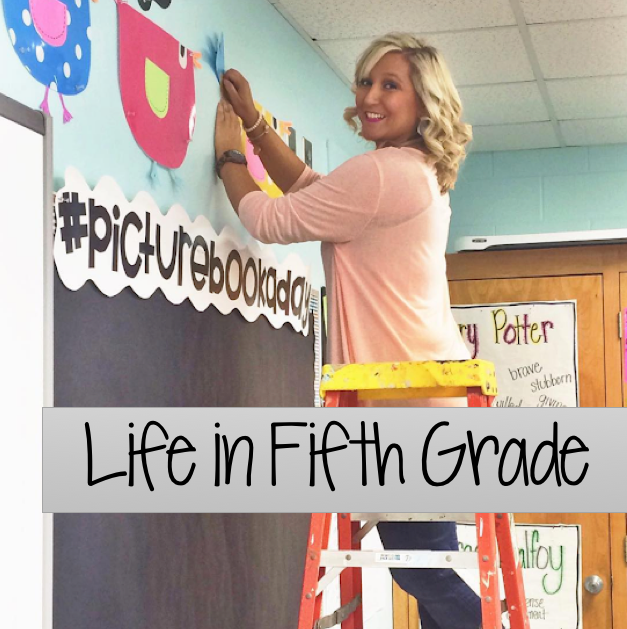 As a teacher that is new to fifth grade, your blog, Instagram, and TPT store have been amazing resources for me! Thank you! Great use of text strategies to meet your classmates! Keep it up! This will be my second year teaching and in 5th grade. 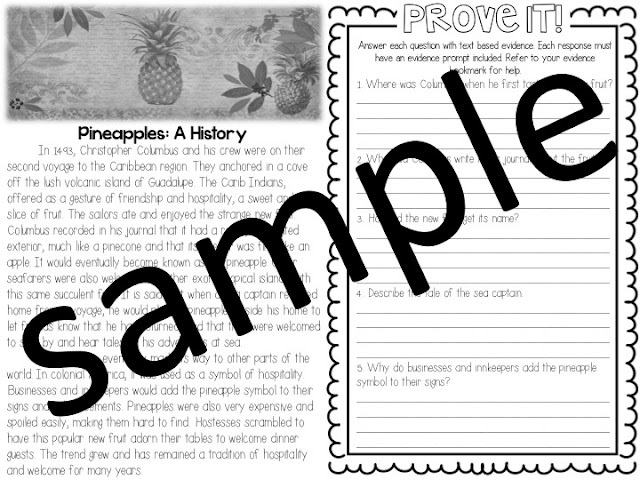 I used tons of your ideas last year, and they were all huge hits with my students. Thanks so much! Thanks for sharing! Great activities! Such a great idea!!! Great way for students to get to know each other!! Hi! I'm new to 5th grade (used to teach 3rd) and just discovered your blog. I'm excited to use this activity - it looks like fun! Thanks! Please pick me! 🙋🙋🙋🙋🙋🙋🙋🙋🙋🙋🙋🙋🙋🙋🙋🙋🙋🙋🙋🙋🙋🙋🙋🙋🙋🙋🙋🙋 I think this activity is so cute! 😍😍😍😍😍😍😍😍😍😍😍😍😍😍😍😍😍😍😍😍😍😍😍 I'd love to use it my first week as well!!!!!!! What a creative idea-I love it! I especially love the partner cards. What a fun way to pastor the kids up! Thank you for sharing! I love starting out the year by reading a nonfiction piece. Sets the tone for learning! Saw your blog for the first time today, and I love this pineapple idea! My students are 2nd and 3rd graders - not 5th - but I'm wondering if you think this could be used for these younger kiddos?? In South Carolina, the pineapple is our symbol of hospitality and can be found on furniture, kitchen items, and lots of places around our beautiful state. This activity would be a wonderful beginning to our year. I would love to be able to use this the first week! What a great way for everyone to get to know each other and learn something in the process! I am so excited to use this. We also start back to school on a Wednesday, so we will have time to do this types of lessons. I love that it's authentic learning while solidifying classroom procedures. This sounds like a great activity! We also start school on a Wednesday and will have time to include this types of lessons into our back to school week. I am excited about how it combines authentic learning while solidifying the procedure of partner work. Crossing my fingers!! What a cool back to school project! What a great idea to integrate skills and back to school fun! This sounds like so much fun! Thanks for another great activity! Love this idea! We start school on Wednesday too! I am going to use this!! I love this! It is great that it introduces the evidence based terms to the students during week 1. This will be my 2nd year of teaching but my 1st year in 5th Grade. I LOVE this idea. My nephew was just telling me about the history of the pineapple last week. THANK YOU! I totally love this idea! We start school on a Wednesday as well. This will be perfect on so many levels. I am also moving from 3rd to 5th this year. THANK YOU! Super cute! I always have my students do actual "work" the first day and this seems perfect. I use memory game cards to partner up my students, but I love the character one you created. Love this! Looks like it would be fun for my speech kiddos! I love this lesson!! I hope I am not too late to win this for my 4th graders this year! I think of you every time I see pineapples because of your instagram. LOL!! 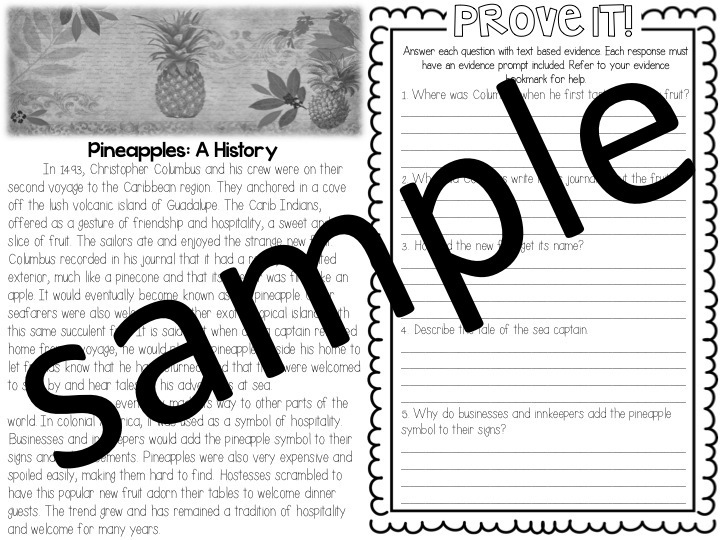 I like the idea of starting the year of with informational text. This is awesome! I am already thinking of how I will modify it to work with my 3rd graders. I love the idea of interviewing someone to learn something new about them. I am absolutely loving your ideas and website. I am going into my second year of teaching 5th grade ELA and can't wait to implement your ideas. What a great idea! I am thinking about how I can modify this for my 6th graders. I'm heading back to the fifth grade this year. This would be a great first day activity! I just bought a pineapple flag to "welcome" the kids back to school. This would be a great way to tie it all together! Love this!! Of course all of your resources are great! Love it! And I just saw a way to make mango purée into ice cream and was thinking that would be a fun "science experiment" for the first week. To go with this unit, I could make pineapple purée! Love it! I just saw a way to make mango purée into ice cream and thought that would be a fun first week "science experiment." I could use pineapple purée instead! How fun! Thank you for this awesome idea! I will use this. Love this idea, will definitely use it! 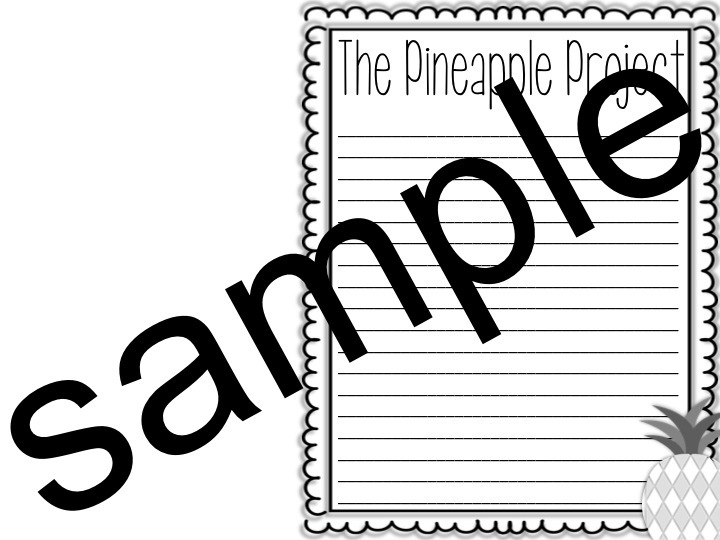 Is there a link to the Pineapple pages/outline? Would love to do this activity in a few weeks! Way cool and different! I look forward to completing this activity with my new group of students. This would be awesome for my before and after school enrichment program!! I have 72 kiddos!! Hi Leslie-is there a link to get this great activity? I'd love to use it for my first week back! I couldn't see anything above. Thanks! Awesome idea! I plan to do this next week when we start school. Looks like a great first week activity!! This looks like so much fun! I think my 5th graders would love doing this. This looks like a great way to incorporate some of those back to school get to know yous with nonfiction reading AND being creative!!! This looks like a great project! Looking for ways to change up the first week of school in my 15th year of teaching. This would be a great way to change it up! How can I get a download of this project? I love it! What a well thought out idea. So creative. Thank you for posting your fun plans!